We learn from internet source Wikipedia that notable classical singers who have recorded Martini’s original song include Rosa Ponselle, Victoria de los Ángeles, Tito Schipa, Fritz Wunderlich, Elisabeth Schwarzkopf, Janet Baker, Inessa Galante, Yvonne Kenny and many others. One of the more unusual recordings is by Paul Robeson. Notable appearances in films include Irene Dunne in Love Affair; Montgomery Clift played the music on the piano and sang the song as well in The Heiress; the song’s music is featured in the opening of the 1955 movie We’re No Angels; Joely Richardson, as Marie Antoinette, sings it in the 2001 film The Affair of the Necklace; “Plaisir d’amour” is sung by a children’s choir in “The Breaking Point”, an episode of HBO’s 2001 World War II television miniseries Band of Brothers; the 1987 movie La Famiglia by Ettore Scola; the tune is heard repeatedly in the 1977 film March or Die. The melody was used for several songs with new lyrics, including “Can’t Help Falling in Love”, with Elvis Presley. I have arranged this beautiful classic song into 3 distinct sections. 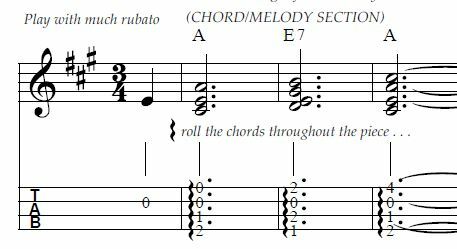 The first section was arranged in a basic Chord/Melody version. Typically in this style, simply strumming the chord with the melody usually on the highest string allows for both accompaniment and melody to be played simultaneously. To give more richness, color and sustain to the strummed chords I recommend a slow rolling strum with the thumb. 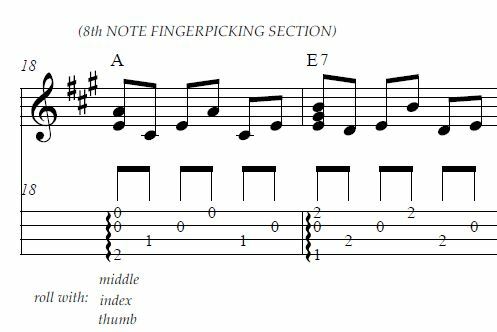 The 2nd section is a standard 8th note fingerpicking pattern. Middle finger or m plays the 1st string. Index finger or I plays the 2nd string. Thumb or p plays the 3rd and 4th strings. 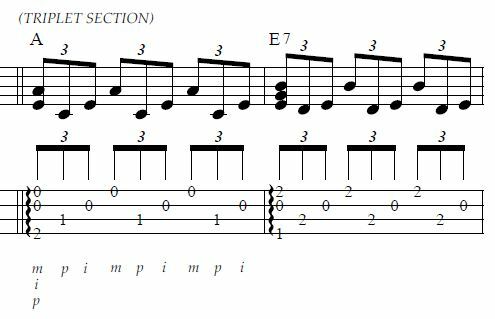 The melody can vary generally from first string to second string. On occasion the melody can be on the 3rd string, in which case it is played by the thumb. The 3rd section uses a triplet figure in 4/4 time exactly like the Bach/Gounod Ave Maria or such classics as Beethoven’s Moonlight Sonata. 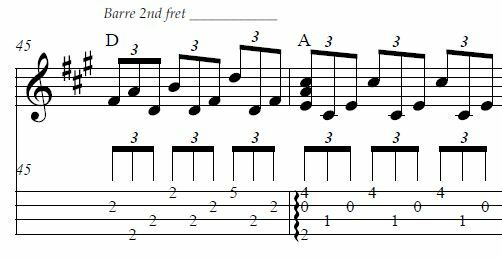 Note that in most tablature arrangements but simply following the chord indications given above will most often set up the left hand fingers for the notes to be played. Often one only needs to add a finger or move a finger up and down to grab the notes needed for the melody. Below is an example, however, when the arrangement calls for an alternate or inverted position for a standard chord. In this case the D major chord. It requires the technique of barring to achieve this. This is a very good reason why it’s important to acquire the skill of barring. 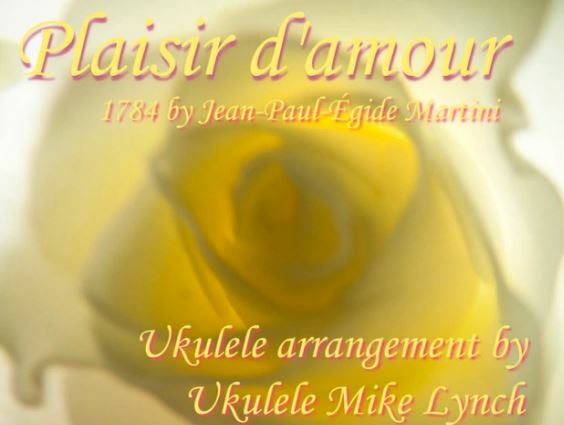 By the way, a number of months ago I did a ukulele arrangement of the song Can’t Help Falling In Love by Elvis Presley which is based on Plaisir d’amour. Here is a VIMEO performance of this arrangement.